I love to try something new – particularly when that something is a keyboard or mouse. So, when inventor Wayne Rasanen offered me the chance to test his company’s latest prototype, the mobile In10Did keyboard, I took him up on it. The unit I received is sort of a miniaturized cross between the Alphagrip and the new European Yogitype. But the particular design isn’t as important as the thinking behind it, which could open up many new possibilities in the world of keyboards. The In10Did mobile prototype is small enough to fit in the palm of your hand, but still tethered to a USB cable. A wireless version is planned. Rather than referring to a specific device, “In10Did” refers to a chorded keyboard system developed by Wayne Rasanen. Chorded keyboards, which make many letters with few keys, are nothing new. The first stenotype machine, a kind of chorded keyboard still in use today by courtroom reporters, was developed in 1830. Other versions of the idea, such as the Frogpad, have been developed for use with computers. In10Did differs from others in that its chords consist of only two button presses each, maximum. 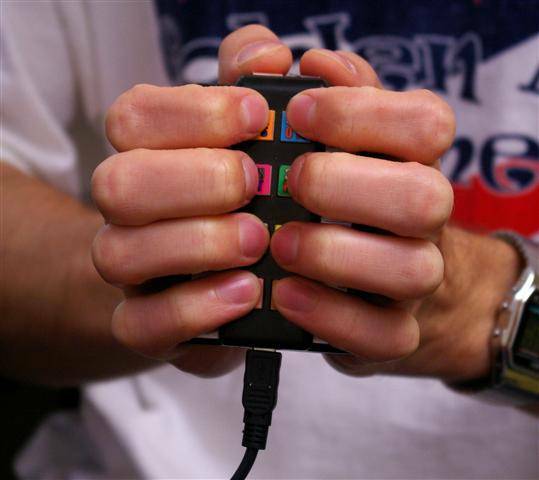 Thus, with ten buttons – one for each finger – you can make 100 different inputs. That’s enough to cover virtually everything on a QWERTY keyboard. Since there are only 10 buttons on an In10Did keyboard, it is not necessary to remember any key positions as with QWERTY or another standard layout. Instead, the user must memorize finger combinations. The first ten letters of the alphabet are easy enough, corresponding to single keypresses by your ten fingers. The next sixteen start to get more complicated. To make the alphabet’s eleventh letter, for instance – K – you hold down the red right-thumb key and press the right index finger. Space, backspace, and shift are made with different combinations of the thumb and index finger buttons. Once you get to numbers and punctuation, things start to become really weird. The one central concept you must understand for the In10Did keyboard to make any sense is this: Every key on the keyboard – not just the two thumb buttons – is also a modifier key. For instance, to type a period, you hold down the A key and press the H key. To make the number 7, you hold down the J key and press the A key. “The IN10DID system configuration is alphabetic, which makes learning the interface a simple task.” As you can see from the quick introduction above, this comfortable phrase from the documentation doesn’t quite tell the whole story. There’s no way around the fact that learning even fifty key combinations (to cover the alphabet, numbers, and common punctuation – never mind special keys) is a daunting proposition. Then again, learning the letter positions on QWERTY isn’t exactly intuitive. The difference, of course, is that most people reading this already know QWERTY. That said, Mr. Rasanen has put some thought into making his layout easier to retain. The documentation will start you off by learning to think of your fingers according to number, instead of awkward descriptions such as “left ring finger.” This part is simple enough: Holding your hands palms down, the fingers are numbered from one to zero, like the top number row of a QWERTY keyboard. Thus, your left pinkie is 1, your right ring finger is 9, and your right pinkie is zero. To help you learn the alphabet from here, memory aids are introduced. For example, the number 8 finger (your right middle) covers B, L, T, and 8. Sandwich lovers will immediately get the delicious acronym, and the 8 matches the finger number. This approach has its limits. Some of the acronyms are a bit weak (#3 is “HPX for Hewlett-Packard and Windows XP“) and the memory aids are less helpful when you get into punctuation and special keys. Still, I’m impressed by the creative approach here. It reflects a willingness to think outside the box that is characteristic of Mr. Rasanen and In10Did. There is a little flash-based computer game on the In10Did website designed to help you pick up the layout. While it won’t win any awards for slick graphics, shooting down the letters as they fly toward you through space does help drill them into your head. 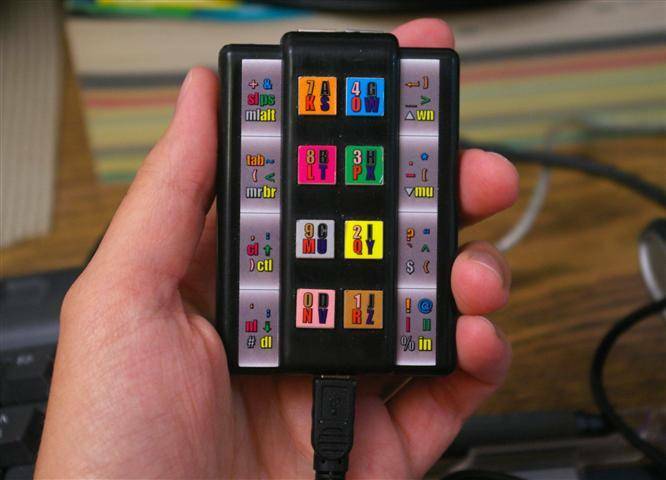 Described here is the ideal In10Did use scenario: Ten fingers matching up to ten buttons. In the real world, some people don’t have ten usable fingers – and even more people don’t want to use all the ones they’ve got for typing. Technically, In10Did only requires two digits to operate, which regrettably prompts some folks to type on it with their thumbs. Others drive the mobile design with the fingers of just one hand; an understandable choice, given its small size and the attendant difficulty of getting both hands around it. It should be noted, however, that one-handed use drastically reduces the system’s versatility; if fingers are moving from key to key, we’re once again dependent on a physical layout. I asked Mr. Rasanen how fast it is possible to type on the current In10Did keyboard. His reply was that a user had reached 30 words per minute, one-handed. Currently there is no speed figure available for two-handed use, but I suspect that such a number would fall well within acceptable ranges. These concept designs from In10Did show the limitless possibilities of the system. Every device pictured here is, or contains, a fully functional In10Did keyboard. Here is the really ergonomic thing about the In10Did keyboard design, the thing that I find most intriguing about it: There is no design. The In10Did philosophy is that users should be able to type without having to remember a complex physical layout of buttons. Thus, an In10Did keyboard is not defined by its shape at all, but only by the fact that it has ten buttons, arranged in such a way that one finger can rest on each. 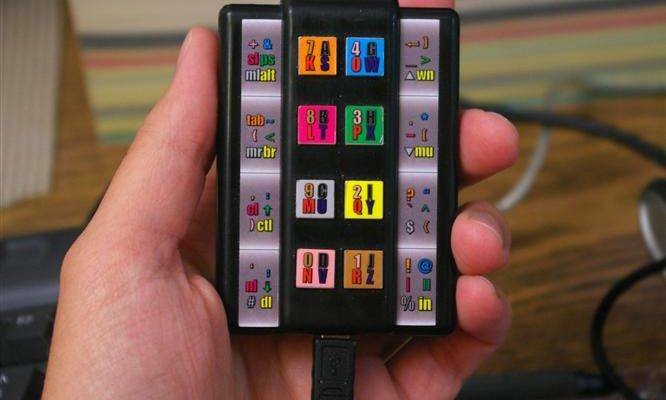 You could literally make an In10Did keyboard by embedding ten buttons in a glob of Play-Doh, and any two-handed In10Did user could pick it up and start typing without a fumble. 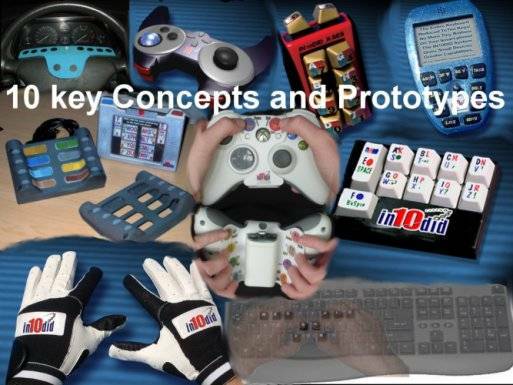 Essentially, In10Did makes your body the main part of the input device. The physical shape of the “keyboard” can be almost anything. It can also be practically nothing, as In10Did has illustrated with a conceptual pair of “typing gloves.” With sensors in the fingertips, such a pair of gloves would allow you to “type” on any reasonably hard surface without the need for a separate input device. The ergonomic possibilities here are almost unlimited. Just trying to type on the In10Did mobile with two hands can make a user’s knuckles go white. Many people end up using it with only one hand, which works but reduces the versatility of the system. To return from theory to the current state of things, I found the In10Did mobile prototype anything but ergonomic. To hold it two-handed, your hands must be almost curled into fists, with the knuckle rows all but touching. The layout is this way for a reason: Like a more plausible version of the AlphaGrip, the In10Did aspires to get integrated with mobile phones. In that context it would make more sense, comparing favorably as it does to the tiny buttons and unyielding glass plates with which the current generation abuses their thumbs. In any other application, I would consider it a cramped disaster – particularly if you have large hands. A primary keyboard it is not – nor, thankfully, is it intended to be. In my opinion, Mr. Rasanen should take inspiration in this regard from another chorded keyboard, the Frogpad. Frogpad – now that’s a cute, memorable moniker that actually makes me curious about the product. In10Did, by contrast, sounds like something from the periodic table. That may be okay for a prototype, but whenever this thing gets to the major market, I’m hoping it will appear with a less wonkish name. The ambitious goal of the In10Did project is to get the system integrated with other devices. The first target is the needy mobile phone market, currently stuck with sub-standard, thumb-blowing solutions for typing on the go. In this crusade for reform I wish Mr. Rasanen well, though I tend to doubt that any real-world phone maker would ever take a chance on something so radical. The second part of the In10Did vision goes further, imagining a world where In10Did keyboards are embedded into everything: The arms of your easy chair; your video game controller; the ATM downtown – perhaps your toaster? These ideas become plausible because of the fact we discussed earlier: If you use In10Did with all of your fingers there is effectively no key layout, so typing on your video game console would be the same experience exactly as typing at your desk – or for that matter on a picnic table, through your special In10Did gloves. In10Did is an interesting idea, and I enjoyed the opportunity to try it out. If you would like to get a prototypical In10Did keyboard, a limited number of the devices are available directly from the company through their eBay store. Keep in mind that the current model is of rough construction and really only suitable for experimenters. The next round has better buttons planned, and wireless connectivity soon after that. The In10Did keyboard system. Coming soon to a phone (or a toaster) near you.